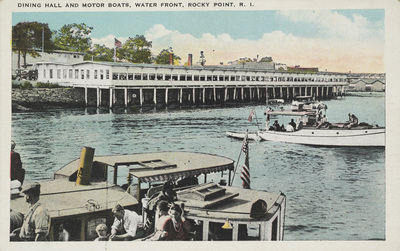 "Dining Hall and Motor Boats, Water Front, Rocky Point, R.I." by G.H. Gennawey, Rocky Point, R.I. Dining Hall and Motor Boats, Water Front, Rocky Point, R.I.
G.H. Gennawey, Rocky Point, R.I.
G.H. Gennawey, Rocky Point, R.I., "Dining Hall and Motor Boats, Water Front, Rocky Point, R.I." (1935). Rhode Island Postcards. 272.